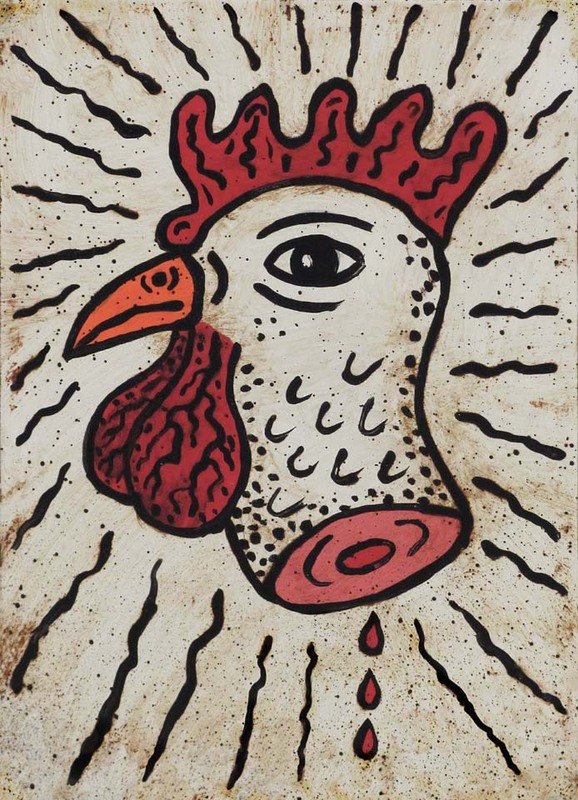 Artist Jeffrey Vallance’s artwork will be displayed at CSUN Art Galleries until May 16th, to celebrate the 40th anniversary of “Blinky the Friendly Hen.” Photo provided by CSUN Art Galleries. California State University, Northridge is celebrating the 40th anniversary of “Blinky the Friendly Hen,” a satirical show of thought-provoking artwork by artist and alumnus Jeffrey Vallance, with an exhibition in CSUN’s Art Galleries that runs through March 16. The exhibition features work from 75 international artists, as well as CSUN faculty, staff and students, to honor Blinky’s legacy. The show is free and open to the public. On Feb. 16 at 1 p.m., the gallery will host an artist walkthrough, where Vallance will guide visitors through his work. Vallance created “Blinky the Friendly Hen” in 1978 while an undergraduate art student at CSUN. He wanted to know how people would react to an animal that is usually not chosen as a pet being buried at a pet cemetery, he said. He chose a frozen chicken from a grocery store, to represent the chickens that are raised and slaughtered every year for consumption. He went on to publish a book in 1989 about his artistic experience, which “helped launch Blinky into popular culture,” and led Vallance to be invited as a guest on shows such as “Late Night with David Letterman” and exhibitions across the world. Over the past four decades, Vallance has taken each major anniversary of the phenomenon to reexamine his thoughts and others’ perceptions of Blinky with new exhibitions. These re-examinations and his original work are included in the current CSUN exhibit. This year, Vallance is analyzing themes from various cultures, including several displays and renditions of chickens through relics. Comprised of a “Relic Chamber”, a “Blinky Theatre,” Blinky book editions (1979-2019), chapel, gift shop, stained glass, and historical artifacts, this fourth retrospective exhibition celebrates historical and contemporary works relating to four decades of the Blinky phenomenon. The exhibition is built in the style of a cathedral dungeon. The Blinky Theatre will screen Blinky-related videos, including a 1983 clip of Vallance on “Late Night with David Letterman;” Bruce and Norman Yonemotos’ 1988 video documenting Blinky’s exhumation; a MOCA TV episode, and a punk rock video dedicated to Blinky. The Blinky Gift Shop installation will offer affordable handmade Blinky souvenirs and collectibles, which Vallance said appears as its own installation. For more information on the exhibit, visit: https://www.csun.edu/mike-curb-arts-media-communication/art-galleries/events/blinky-friendly-hen-40th-anniversary.